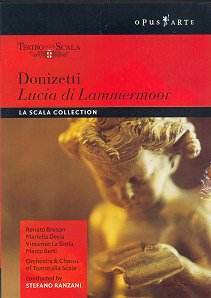 Donizetti�s Lucia di Lammermoor was first performed at the Teatro San Carlo, Naples on 26th September 1835 only seventeen years after the first publication of Sir Walter Scott�s novel. The opera has been firmly established in the repertoire ever since and has attracted fine recordings from some of the world�s leading singers including: Sutherland, Pavarotti and Milnes; Studer and Domingo; Callas, Di Stefano, and Gobbi and Caballé and Carreras. This powerful production recorded from the stage of Milan�s Teatro alla Scala in 1992, is released now from the archives of RAI television. It is a traditional production with imposing sets that heighten dramatic impact and darkly sumptuous costumes. This production is the full version of Donizetti�s opera � i.e. sometimes there are omissions of the Act II scene in which Raimondo assures Lucia that her dead mother would have wanted her to marry Arthur adding that God would help her through her torment, and the Act III scene in which sworn enemies, Enrico and Edgardo agree to a duel to the death. The highlight of the opera is of course the often-recorded mad scene (Il dolce suono). Lucia, in this production is positioned against a receding set of narrow high-spanning castle arches and ascending steps to one very high vertical narrow window giving a sense of vertigo and dizziness that adds atmosphere to the aria. Mariella Devia gives it her all in dramatic (some unkind observers might say rather over-dramatic) and coloratura acrobatic brilliance. Certainly the rapturous applause at its end signified that the highly critical Milan audience was well pleased. Another highlight of this production is the nicely stage-managed and magnificent singing of all concerned in Donizetti�s brilliant Act II sextet (Chi mi frena in tallo momento) when the exiled Edgardo, Lucia�s lover, returns in fury to interrupt the forced wedding of convenience of Lucia to Arturo instigated by Lucia�s cruel, manipulative brother, Enrico. The sextet is completed by the observations of the chaplain Raimondo and Lucia�s companion Alisa. Elsewhere Vincenzo La Scola impresses as Edgardo by turns ardent, vengeful then despairing. His Act III arias amongst the tombs of the Ravenswood are most moving and again drew very warm applause. Marco Berti, a higher-voiced, more lyric tenor, makes a dashing and remarkably handsome Arturo so much so that one wonders how Lucia could resist him in favour of a less imposing-looking Edgardo. Carlo Colombara is a tower of ecclesiastical strength as the sympathetic yet �politically correct� Raimondo and Ernesto Gavazzari is all machiavellian slyness as the scheming Normanno. But it is cruel eyed, intransigent Renato Brusson as Lord Enrico Ashton who upstages all giving a magnificent performance in voice and acting. A definite disadvantage of this album, i.e. - for repeated viewings when one might want to dip into the DVD for selected scenes - is the restricted number of chapter headings, without aria names, necessitating leaning on the fast forward button to home onto precise cues. A powerfully dramatic and memorable La Scala production. Recommended.